Property was beautiful! The parking situation was a little confusing at first, but maybe just because we don't usually stay downtown when we go places. Would definitely stay again! Nice place to stay. Close to convention center. Nice area to walk, run in. There are scooters you can rent to see the area also. I would stay here again helpful friendly staff. Nice hotel but feels very corporate due to size. Did have an excellent dinner at Bob's (the Omni Hotel's high end restaurant). I wanted a view of Downtown but instead I got a view of a radio tower. Not what I expected. Valet was excellent. Always there to open and close doors so efficient. Front desk could use some work. Also would have appreciated preference for seating at the sports bar since we we actually staying at the hotel. Had to wait about an hour but would Have gladly let the hotel know we would be watching the game ahead of time If given the opportunity. Lots of people just coming to the hotel to Watch game off the street. Crazy. Excellent customer service upon check-in. The check-in was quick, pleasant and efficient. Comfortable room and a convenient location. I would definitely go back. Hotel in excellent shape and the service was fantastic including From wyattt. My second straight spectacular stay at an Omni - I will keep Coming back. One of best features is the 4pm check out with My Omni club membership. Love that!! Thanks again. 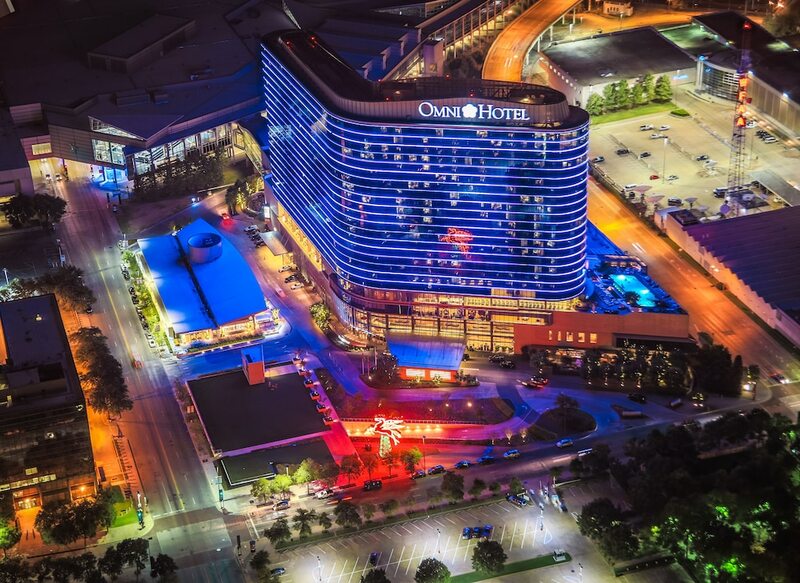 Located in Downtown Dallas, Omni Dallas Hotel is adjacent to Kay Bailey Hutchison Convention Center and within a 10-minute walk of other popular attractions like Reunion Tower. This 4.5-star hotel welcomes guests with 1001 rooms and conveniences like a full-service spa, an outdoor pool, and a fitness center. It's connected to the convention center in central Dallas, and also a short walk from Sixth Floor Museum and Dallas World Aquarium. Have a drink at the sports bar or enjoy onsite dining at 7 restaurants, such as Texas Spice that specializes in local cuisine and serves breakfast, brunch, lunch, and dinner. Savor a meal from the privacy of your room with 24-hour room service, or get a pick-me-up at the coffee shop/café. Start each morning with full breakfast, available for a fee from 6 AM to 10:30 AM. An LCD TV comes with pay movies, and guests can stay connected with WiFi and wired Internet. The pillowtop bed provides a full night's sleep and the bathroom offers hair dryers. Other standard amenities include an iPod dock, a coffee maker, and a laptop-compatible safe. Guests of Omni Dallas Hotel enjoy a full-service spa, an outdoor pool, and a fitness center. Valet parking is offered for USD 34 per night. Front-desk staff can answer questions 24/7, and assist with securing valuables, dry cleaning/laundry, and tours or tickets. Other amenities at this luxury hotel include a spa tub, a sauna, and a rooftop terrace. Texas Spice - Restaurant and bar specializing in local cuisine. Open daily for breakfast, brunch, lunch, and dinner. Kid's menu available. Bobs Steak and Chop House - Steakhouse and bar open daily for dinner. Uptown Terrace - Poolside restaurant and bar open daily for lunch and dinner. Alfresco dining available (weather permitting). Owners Box - Sports bar open daily for lunch and dinner. Morsels - Coffee shop. Open daily. The hotel has an outdoor pool and a spa tub. A sauna and a fitness center are other recreation options. The preferred airport is Dallas, TX (DFW-Dallas-Fort Worth Intl. ).